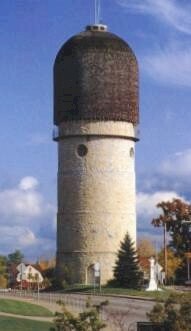 The stone water tower has been considered a symbol of Ypsilanti for many years. The landmark retains the original design as completed on February 3, 1890, and has been in continuous service since that time. The 147-foot high elevated reservoir contains a steel tank with a 250,000-gallon capacity. The main purpose for the reservoir is to store a reserve supply of water to feed cast iron mains constructed in 1885. The elevation provides sufficient gravity pressure to furnish fire service in emergencies. In planning the design, Mr. W. R. Coats, construction engineer, considered purpose as well as overall appearance. Resting on a foundation of concrete mortar six inches deep, the substructure walls, made of Joliet stone, are 40 inches thick at the base and 24 inches thick at the top. Constructed on top of the walls were l0-inch steel I-beams spaced two feet apart and crossing the walls at right angles. The steel reservoir tank rests on the beams and walls of the substructure. Finally, at 147 feet above ground level, there is a cupola with glazed windows. The total cost of construction was $21,368. The tower was constructed with local day labor. To Mr. Coats's chagrin, the workers constructed three stone crosses, one over the outside west door and two others inside the tower, to protect them from injury. In fact, there were no fatal accidents during construction. To maintain the solidity and beauty of the tower, YCUA had the structure renovated in 1976 at the cost of $114,694. This involved reshingling the roof, replacing beams and barriers, repainting and other general repairs. In 1987, YCUA reconstructed the entry doors. With each repair and renovation, YCUA has always attempted to maintain the original appearance of the tower. YCUA's water tower was acknowledged in 1975 when it was selected as an American Water Landmark by the American Water Works Association (AWWA). The tower is one of several sites selected in the nation for its historical significance to the community as a water supply and the first designated site in the State of Michigan. In 1987, the Ypsilanti Heritage Foundation honored the structure by designating the tower as a historical architecture in Ypsilanti. 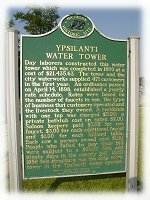 In 1988, the Ypsilanti stone tower became a Registered Michigan Historical Site as listd by the Bureau of History, Michigan Department of State. A large marker beside the tower reads: "Day laborers constructed this water tower, which was completed in 1890 at a cost of $21,435.63. The tower and the city waterworks supplied 471 customers in the first year. An ordinance passed on April 14, 1898 established a yearly rate schedule. Rates were based on the number of faucets in use, the type of business that customers operated and the livestock they owned. A residence with one tap was charged $5.00; a private bathtub cost an extra $2.00. Saloon keepers paid $7.00 for one faucet, $3.00 for each additional faucet, and $1.00 for each billiard table. Each cow a person owned cost $1.00. People who failed to pay their bill were subject to a $50.00 fine and ninety days in the county jail. 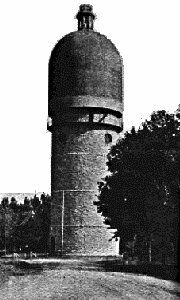 Until 1956, this structure was the only water tower in the Ypsilanti water system." In 1996, the stone tower was designated a Michigan Historical Civil Engineering Landmark by the American Society of Civil Engineers (ASCE). In 2004, it was featured in the national magazine, Esquire, in a column titled, "Man At His Best: The Nine Most Remarkable Things in Culture This Month." As a landmark and attractive physical feature, the Ypsilanti Water Tower continues to be a symbol of the city of Ypsilanti.